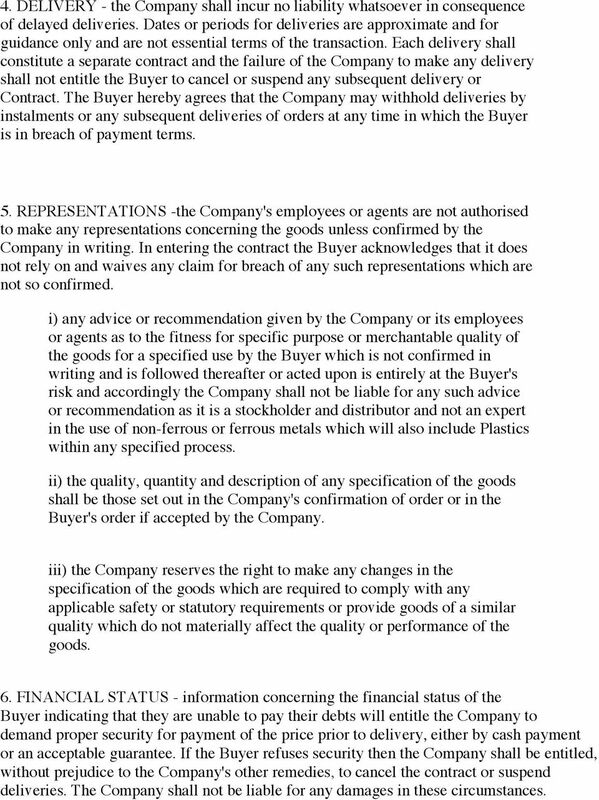 Download "In these conditions "the Company" means Pro Formance Metals Limited"
1 Terms and Conditions of Sale In these conditions "the Company" means Pro Formance Metals Limited 1. 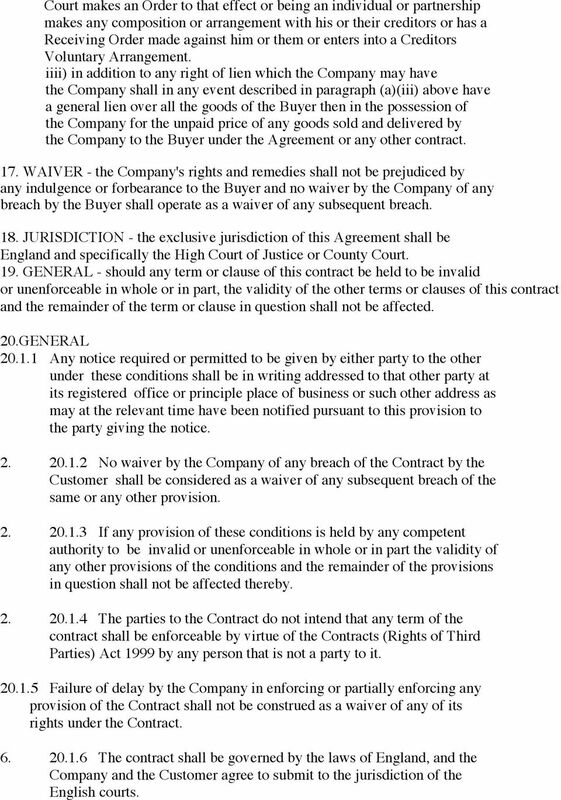 ALL CONTRACTS OF SALE - incorporate these Terms and Conditions. 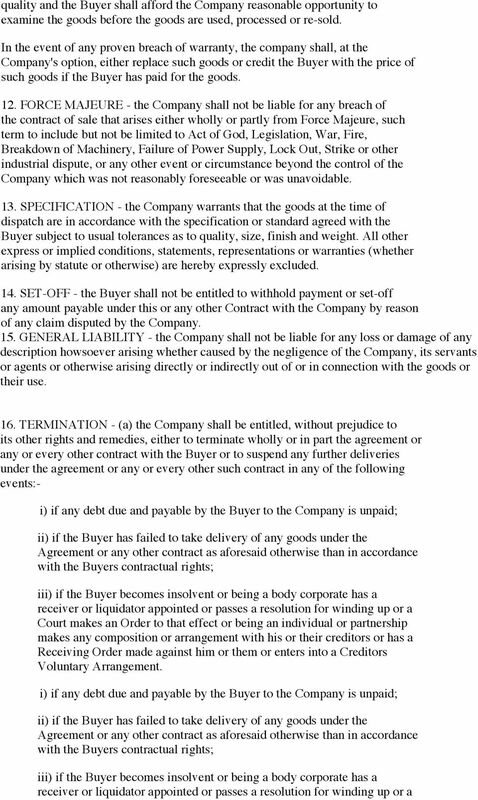 Any variation of these Terms and Conditions either prior to an agreement being reached or subsequently by way of novation can only be concluded in writing signed by a Director of the Company. 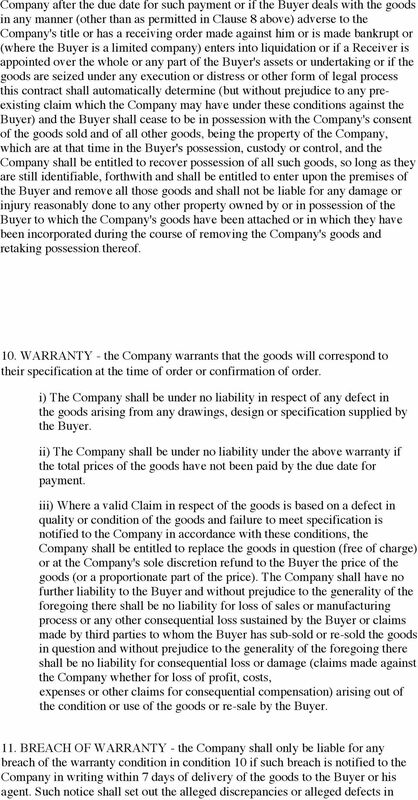 The Buyer hereby agrees that any of the Terms and Conditions contained in their order which are at variance with these Terms and Conditions shall have no effect so far as they are inconsistent with these Terms and Conditions. 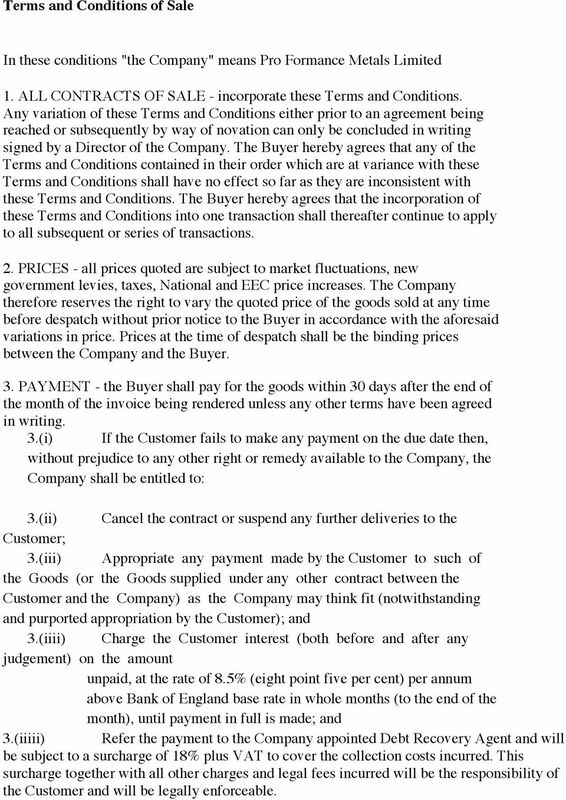 The Buyer hereby agrees that the incorporation of these Terms and Conditions into one transaction shall thereafter continue to apply to all subsequent or series of transactions. 2. PRICES - all prices quoted are subject to market fluctuations, new government levies, taxes, National and EEC price increases. The Company therefore reserves the right to vary the quoted price of the goods sold at any time before despatch without prior notice to the Buyer in accordance with the aforesaid variations in price. Prices at the time of despatch shall be the binding prices between the Company and the Buyer. 3. PAYMENT - the Buyer shall pay for the goods within 30 days after the end of the month of the invoice being rendered unless any other terms have been agreed in writing. 3. (i) If the Customer fails to make any payment on the due date then, without prejudice to any other right or remedy available to the Company, the Company shall be entitled to: 3. (ii) Cancel the contract or suspend any further deliveries to the Customer; 3. (iii) Appropriate any payment made by the Customer to such of the Goods (or the Goods supplied under any other contract between the Customer and the Company) as the Company may think fit (notwithstanding and purported appropriation by the Customer); and 3. (iiii) Charge the Customer interest (both before and after any judgement) on the amount unpaid, at the rate of 8.5% (eight point five per cent) per annum above Bank of England base rate in whole months (to the end of the month), until payment in full is made; and 3. (iiiii) Refer the payment to the Company appointed Debt Recovery Agent and will be subject to a surcharge of 18% plus VAT to cover the collection costs incurred. This surcharge together with all other charges and legal fees incurred will be the responsibility of the Customer and will be legally enforceable. 2 4. DELIVERY - the Company shall incur no liability whatsoever in consequence of delayed deliveries. Dates or periods for deliveries are approximate and for guidance only and are not essential terms of the transaction. Each delivery shall constitute a separate contract and the failure of the Company to make any delivery shall not entitle the Buyer to cancel or suspend any subsequent delivery or Contract. The Buyer hereby agrees that the Company may withhold deliveries by instalments or any subsequent deliveries of orders at any time in which the Buyer is in breach of payment terms. 5. REPRESENTATIONS -the Company's employees or agents are not authorised to make any representations concerning the goods unless confirmed by the Company in writing. In entering the contract the Buyer acknowledges that it does not rely on and waives any claim for breach of any such representations which are not so confirmed. i) any advice or recommendation given by the Company or its employees or agents as to the fitness for specific purpose or merchantable quality of the goods for a specified use by the Buyer which is not confirmed in writing and is followed thereafter or acted upon is entirely at the Buyer's risk and accordingly the Company shall not be liable for any such advice or recommendation as it is a stockholder and distributor and not an expert in the use of non-ferrous or ferrous metals which will also include Plastics within any specified process. ii) the quality, quantity and description of any specification of the goods shall be those set out in the Company's confirmation of order or in the Buyer's order if accepted by the Company. iii) the Company reserves the right to make any changes in the specification of the goods which are required to comply with any applicable safety or statutory requirements or provide goods of a similar quality which do not materially affect the quality or performance of the goods. 6. FINANCIAL STATUS - information concerning the financial status of the Buyer indicating that they are unable to pay their debts will entitle the Company to demand proper security for payment of the price prior to delivery, either by cash payment or an acceptable guarantee. If the Buyer refuses security then the Company shall be entitled, without prejudice to the Company's other remedies, to cancel the contract or suspend deliveries. The Company shall not be liable for any damages in these circumstances. 6 Court makes an Order to that effect or being an individual or partnership makes any composition or arrangement with his or their creditors or has a Receiving Order made against him or them or enters into a Creditors Voluntary Arrangement. 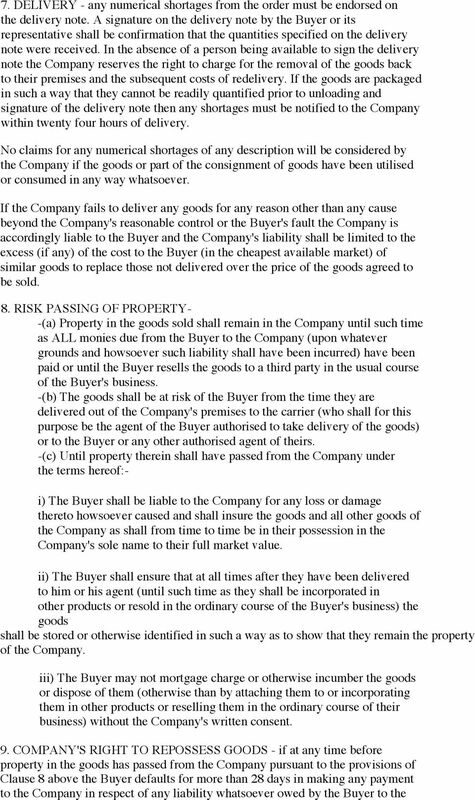 iiii) in addition to any right of lien which the Company may have the Company shall in any event described in paragraph (a)(iii) above have a general lien over all the goods of the Buyer then in the possession of the Company for the unpaid price of any goods sold and delivered by the Company to the Buyer under the Agreement or any other contract. 17. WAIVER - the Company's rights and remedies shall not be prejudiced by any indulgence or forbearance to the Buyer and no waiver by the Company of any breach by the Buyer shall operate as a waiver of any subsequent breach. 18. JURISDICTION - the exclusive jurisdiction of this Agreement shall be England and specifically the High Court of Justice or County Court. 19. GENERAL - should any term or clause of this contract be held to be invalid or unenforceable in whole or in part, the validity of the other terms or clauses of this contract and the remainder of the term or clause in question shall not be affected. 20.GENERAL Any notice required or permitted to be given by either party to the other under these conditions shall be in writing addressed to that other party at its registered office or principle place of business or such other address as may at the relevant time have been notified pursuant to this provision to the party giving the notice No waiver by the Company of any breach of the Contract by the Customer shall be considered as a waiver of any subsequent breach of the same or any other provision If any provision of these conditions is held by any competent authority to be invalid or unenforceable in whole or in part the validity of any other provisions of the conditions and the remainder of the provisions in question shall not be affected thereby The parties to the Contract do not intend that any term of the contract shall be enforceable by virtue of the Contracts (Rights of Third Parties) Act 1999 by any person that is not a party to it Failure of delay by the Company in enforcing or partially enforcing any provision of the Contract shall not be construed as a waiver of any of its rights under the Contract The contract shall be governed by the laws of England, and the Company and the Customer agree to submit to the jurisdiction of the English courts. We: - all references to 'we' below shall be taken as meaning Kierbeck Thames Ltd.
(2) name whose principal place of business is address (hereafter referred to as 'the Consultant'). DATED ------------ TERMS AND CONDITIONS FOR THE SUPPLY OF SERVICES OF DEBT RECOVERY PLUS LIMITED The Client's attention is particularly drawn to the provisions of clause 8. 1. INTERPRETATION 1.1 Definitions. STANDARD TERMS AND CONDITIONS FOR SUPPLY OF GOODS AND SERVICES LE MARK SELF ADHESIVE LTD. This Agreement (The Agreement) sets out the terms on which the Company has agreed to provide IT Support to the Customer. 1. Interpretation 1.1. In these conditions the Company means Original Cine Pty Ltd (trading as The Visionhouse) and its successors and assigns of 195 Rouse Street, Port Melbourne, Victoria, Australia 3207.